It's been years since alien bio-warfare killed off all the women on the new world, leaving the men alone with nothing but their thoughts. Literally. They call it the Noise. It is constant, it sounds like the inner voices of everyone nearby, and it is all Todd has ever known. When he senses an impossible gap in the Noise, he looks for the source, and discovers a second impossible thing: the source of the gap in the Noise is a girl. If you like post apocalyptic societies, science fiction, or nail-bitingly compulsive reads, this is for you. 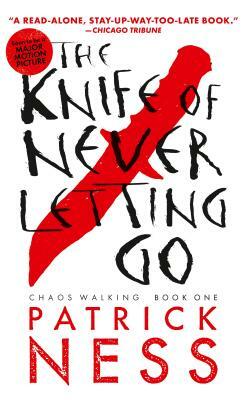 The riveting Chaos Walking trilogy by two-time Carnegie Medalist Patrick Ness, reissued with compelling new covers — and a bonus short story in each book. Todd Hewitt is the only boy in a town of men. Ever since the settlers were infected with the Noise germ, Todd can hear everything the men think, and they hear everything he thinks. Todd is just a month away from becoming a man, but in the midst of the cacophony, he knows that the town is hiding something from him — something so awful Todd is forced to flee with only his dog, whose simple, loyal voice he hears too. With hostile men from the town in pursuit, the two stumble upon a strange and eerily silent creature: a girl. Who is she? Why wasn't she killed by the germ like all the females on New World? Propelled by Todd's gritty narration, readers are in for a white-knuckle journey in which a boy on the cusp of manhood must unlearn everything he knows in order to figure out who he truly is. Patrick Ness is the author of the critically acclaimed and best-selling Chaos Walking trilogy, as well as the Carnegie Medal–winning A Monster Calls, inspired by an idea from Siobhan Dowd. Among the numerous awards he has received are the Guardian Children’s Fiction Prize, the Booktrust Teenage Prize, and the Costa Children’s Book Award. Born in Virginia, he lives in London. Todd and Viola…are realistically portrayed as kids frequently overwhelmed and terrified by their circumstances…The nicely balanced mix of coming-of-age novel, science-fiction adventure, and dystopic thriller will make this an appealing choice for a range of genre readers…still unsolved mysteries, carefully developed by Ness and left at tantalizing moments of resolution, guarantee anticipation for the next two. Skillfully structured narrative creates an elegant mixture of action, dialogue, and dark, dsytopian pathos. Gives us a glimpse of the depth of evil in our hearts…the ending of this book is absolutely chilling and leaves the reader begging for more. This riveting SF thriller is action-packed, with edge-of-your-seat chase scenes, a monstrous villain who just won’t die, and moments of both anguish and triumph…Emotionally intense…haunting page-turner. A read-alone, stay-up-way-too-late book for older readers looking for the combination of being scared and being stirred to gallop to the end. The powerful, gut-clenching cliffhanger will definitely leave you wanting more.